What an amazing beginning we are having to second session! There is something so familiar and comfortable about second session; even though it just started, it feels to me like we’ve been together for a long time. As I walk around Camp, it feels like a camp of old friends and not a camp full of new campers. That is what I love most about Camp Interlaken. A t our opening campfire on the first night of Camp, one camper from each cabin is invited to the center of the circle to throw a stick in the fire and make a wish. I always start my wish by saying the same thing: “There are no strangers here – just friends you have not yet me.” One of my favorite wishes at the opening campfire was the Shoresh (3rd – 5th grade) camper who walked up to the fire and invited her new friend to join her in the middle and wished that everybody makes a new friend just like she did. It was followed with a lot of older camps saying “awwwwwwww” and a lot of snaps. This summer’s opening campfires have been a bit different because our fire circle was beautifully renovated. Traditionally, I always open the fires by sharing that our fires are special because they were built upon the ashes of fires of years past. When we knew that we were going to be renovating the fire circle at the end of last summer, we shoveled five buckets full of ashes from the old fire pit so that we could add “the ashes of years past” to our new fire pit and still be able to reference the l’dor vador (from generation to generation) aspect of a campfire at Camp. Each bucket was to be used for each opening campfire of the summer: leadership staff week, staff week, first session, second session, and family camp. So, before our fire began, I talked about the ashes, and poured the fourth bucket of ashes into the fire pit before lighting the fire. And, with only five days of Camp under our belts, the fire within our campers hasn’t yet gone out. Their energy, ruach (spirit), and excitement about being here in incomparable to any other session in any other year. I forgot how much fun second session really is! Our song sessions that we have after lunch and after dinner have been absolutely incredible and full of spirit. Our camper chugim (activities) are in full force, and our campers have jumped in head first to everything they’re doing. We even did chug changes already so that everybody has their permanent schedule for the next week and a half. Our evening programs have been so much fun and filled with ridiculous adventures, tasks and silliness. Everywhere you look, there are smiles and there is laughter and there is kindness. I am really so proud of who we are as a Camp and as a community. 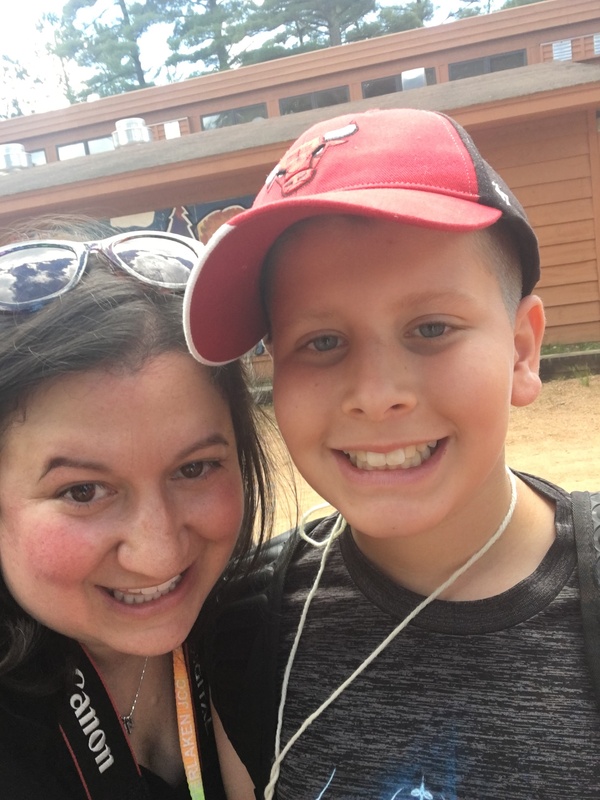 Shabbat is always the most special time at Camp. After lunch, our campers dispersed to their assigned big sweep locations to clean Camp and get the camp ready for Shabbat. Afterwards, everybody showered and puts on their Shabbat best! This Shabbat, we all wore white. The sea of white walking through Camp for the Shabbat walk in really beautiful! 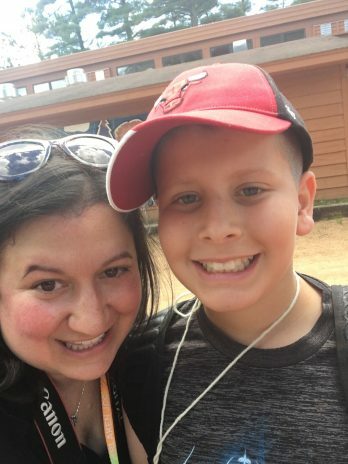 We start at the floval (the cement oval where we raise the flags), and we walk in a line, holding hands, to each cabin where we wish each camper a Shabbat Shalom with a Hershey kiss; they join the back of the line and come with us to the next cabin as we do the same for them. Eventually, we are all together walking onto the athletic field and forming a big circle. I always call a smaller circle into the center to light the candles with us. This week, I called the first year staff into the cente r of the circle. 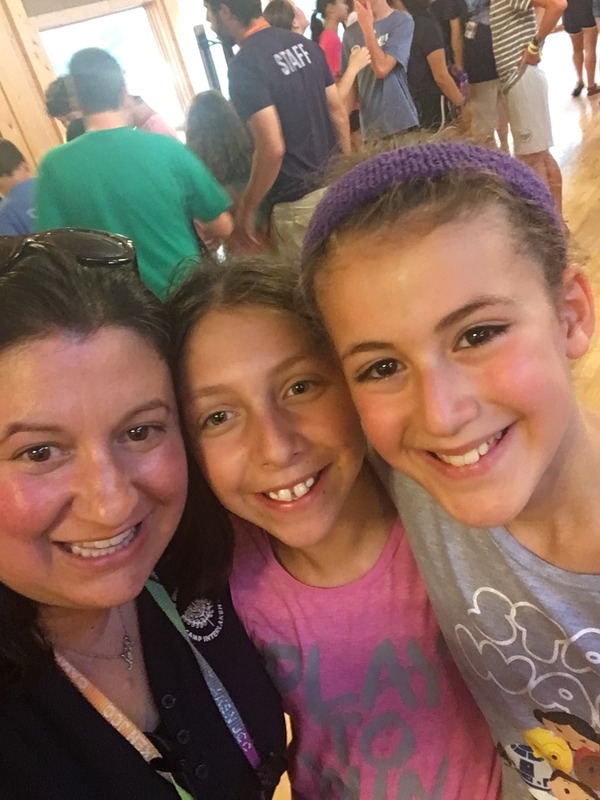 After Sharon, our camp bubbe, lit the candles, we wish the whole camp a Shabbat shalom, and everybody schmoozes for a few minutes before we head over to the athletic field for Kabbalat Shabbat services. This is the perfect time for some great photos like the cabin photos that you saw in the photo gallery. Next week, I will call all siblings and cousins into the center of the circle so that we can take family photos. The 6th graders led Kabbalat Shabbat services, and they did an amazing job! I was kvelling. It was a beautiful service followed by an awesome Shabbat dinner. One of my favorite things that we do on Shabbat is the blessing for the children. The staff stand together with arms around each other singing the blessing over the children as they surround the tables that their campers are sitting at. It’s so beautiful and amazing to have our staff bless their campers the same way that parents have blessed their children at the Shabbat table for thousands of years. For dinner, we ate Natasha’s delicious challah rolls (she’s our baker – she rocks), salad, chicken noodle soup, roast chicken, roasted potatoes, broccoli, and really yummy brownies for dessert. The vegetarians had a quinoa stuffed pepper that was really good. It was an awesome Shabbat meal. Following dinner we had a song session that was incomparable to any other. The ruach that filled the Chadar Ochel (dining room) for our Shabbat song session was unbelievable, and it carried right over into Israeli dancing. What a fun and super sweaty night! Saturday was a perfect day. K’far Noar led Shabbat services, and they did a beautiful job. Hearing everybody’s voices come together was really meaningful and special to everybody. After services, everybody broke off into their Shabboptions – open activities that run for the entire day on Saturday! The heavy dew (what we call rain at Camp because “it never rains here, it’s just heavy dew”) held off until later in the evening, and we were able to play outside all day! It was just perfect! During our afternoon Shabboptions, we stop for about 45 minutes for nosh, or snack. This year we have implemented a sicha, a discussion about a Jewish topic. The goals are to bring Judaism to life in a fun, engaging way where we can teach something to our campers to increase their interest in Judaism. This is a project that I have personally taken on as it is really important to me to deliver successful and interesting sichot to our campers. I realize this message is getting long, and I will write a separate message about sichot in hopes that I may even be able to teach those who are reading. We ended the most perfect Shabbat with the most beautiful Havdallah ceremony! Together, we sat lakeside and sang together our Havdallah songs and prayers. The entire camp was silent as the Havdallah candle was extinguished in the cup of grape juice, and then we erupted into song to sing “Shavua Tov” and wish each other a good week. I know it will be a great week! We have some amazing things coming up this week like day trips for everybody on Tuesday followed by an overnighter for Sha’ar on Monday and for Tzomayach on Tuesday. We will be visited by Camp Butwin, a St. Paul day camp that will be spending a few days at Interlaken. Maccabiah (our color war) may or may not be coming up in this next week (shhhhhh, it’s a surprise), and DJ Kasper from Monster Entertainment and his squad will be here a week from today for an all camp dance party. I am so excited for the upcoming week! As of now, all is LOUD along the shores of Lake Finley as Camp is in action and everybody is doing their thing! 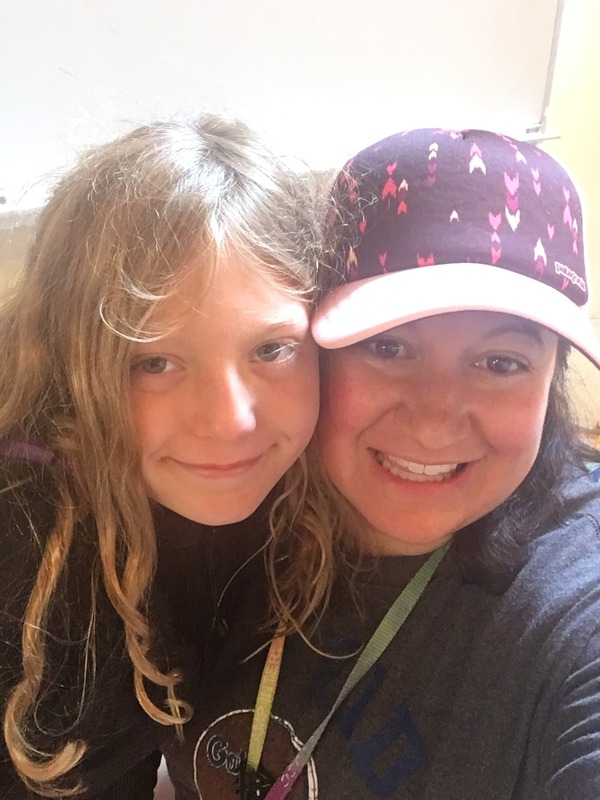 As for me, I am content knowing the Camp is filled with happy, smiling, and laughing campers who are engaged with each other, with their staff and with their activities. Happy Sunday!